Chopper is the funniest and silliest of the Star Wars: Rebels characters, so that makes him the automatic favorite of our 4-year old son. It’s the Ewok and Jar Jar effect (who he also loves), though I think I can safely say that Chopper is not as panned by adults as the furry creatures, nor as despised as our lanky, pink friend. Part of his charm for adults is that he is so crabby. In some ways we can probably relate more to his personality than the heroes or the villains in the show. Plus, I think many of us are assuming he is swearing half the time, so it is always a bit cathartic to seeing him on screen. Now, Chopper was supposed to be the last of our Rebels patterns, before we move on to Rogue One. But we have gotten a few requests, so I think we’ll have 3 more Rebels designs after this one. 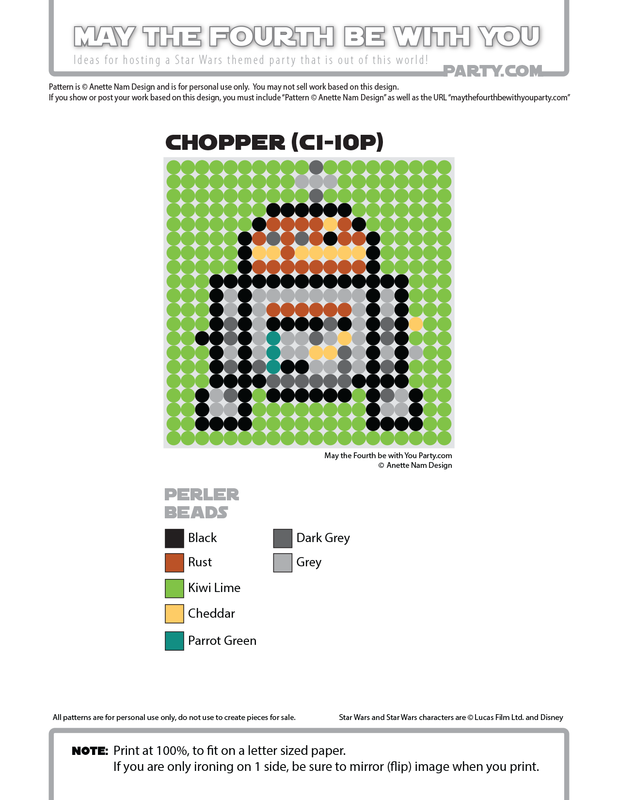 Chopper is #68 in the Perler bead/cross stitch/crochet/knitting/Lego/pixel/mosaic pattern series.